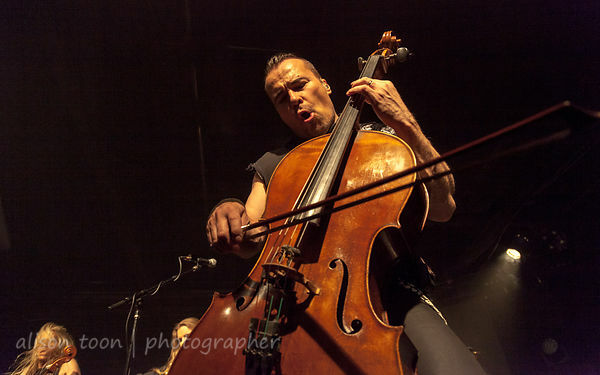 Toon's Tunes : Apocalyptica, symphonic metal; stunning show! When I was a kid, I played the violin. Not very well--I never mastered third position, and I certainly didn't practice enough--but well enough to enjoy the experience of being in an orchestra, performing classical music, and seeing how all the instruments played a part in the tapestry of sound. I grew up in Leicestershire, England, at a time when the education system focused on the arts in a big way; music, drama, art, all part of the daily curriculum. (At one point, I also wanted to learn to play the oboe, probably because of this, but by then I was pretty-much stuck with the violin, until a guitar came along.) We all sat still on the stage, in the correct arrangement for an orchestra; violins to stage right, violas in the middle, cellos, always looking a little uncomfortable, seated to stage left, with all the other instruments tiered behind the strings. Cellos have such a wonderful sound. More seductive than a violin, more curvaceous, more nimble than the double-bass. And not subject to viola jokes. At school, we played Beethoven. We played Bizet's Farandole. As little children, we danced to the Grieg's In The Hall Of The Mountain King. As teens, we sang West Side Story. But never, not once, not ever did we play anything as cool as Metallica songs. Not once! 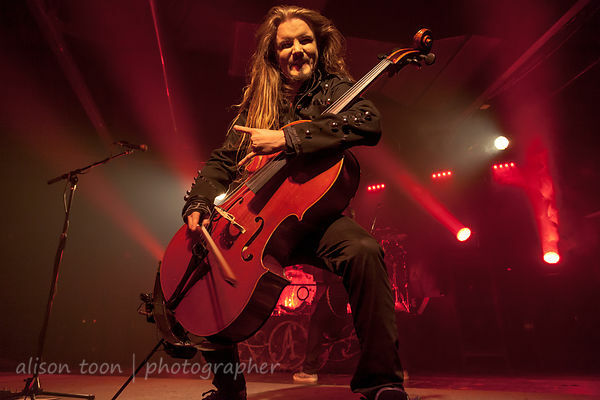 Apocalyptica came to town on Sunday; four classically-trained musicians from Finland--all three cellists attended the prestigious Sibelius Acadamy in Helsinki--playing beautifully-crafted cellos, and rocking one of the best metal shows we've seen this year. The band did indeed begin. twenty or so years ago, by playing Metallica covers, on cello, but has long since grown to include both their own compositions, and classical music with a metal Apocalyptica twist. The show moved through songs with everyone in the audience singing along, to moments as precious as a chamber orchestra for a king, the audience quiet as mice, listening. Chamber music for a dark, metal king, but a king who demands beauty. Beautiful music, beautifully executed. Stunning show. Fluid, moving, cellos looking as light as air; moving with the music, only seated for a moment. 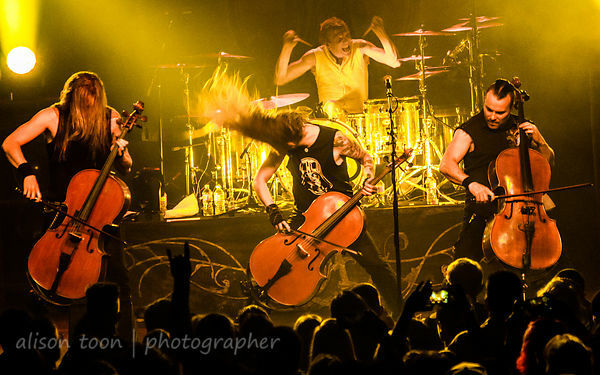 Apocalyptica are cellists Eicca Toppinen, Perttu Kivilaakso, Paavo Lötjönen, and drummer Mikko Sirén. 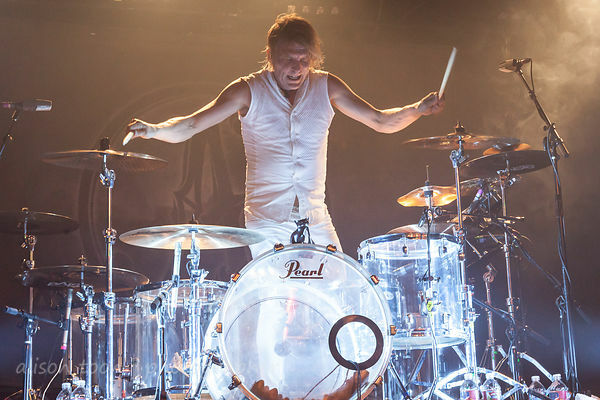 While the core of their work is instrumental, Apocalyptica have collaborated with many well-known vocalists--singers including Corey Taylor, Gavin Rossdale, Brent Smith, and Franky Perez on last year's Shadowmaker album. Adam Gontier, who joined them on stage at the Ace of Spades, Sacramento, for several songs on Sunday evening. Check out their album Worlds Collide, for example, which also has a guest appearance by Japanese guitarist Hotei, or 7th Symphony... oh heck, go listen to them all. And click here to experience Hall of The Mountain King, Apocalyptica's version. 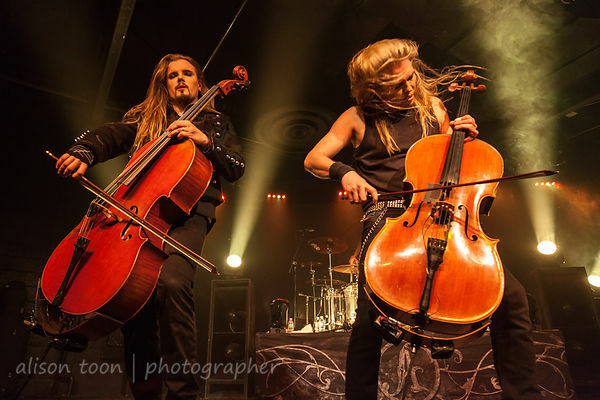 Apocalyptica are on tour throughout the USA and Europe--find them at a venue near you, and keep an eye on their website for news. 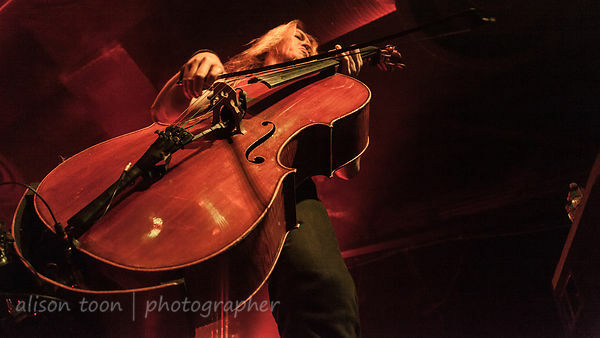 Many more photos in the photo gallery: http://www.alisontoon.com/-/galleries/music/apocalyptica Click there!